i have a trojan horse on my laptop.. my son played on a game site and im assuming thats where its from.. im not computer literate so i have no idea wat to do.. the file is iwingameshookIE.dll .. i have tried to remove it but it wont let me.. ive tried to quarantine it but it wont let me.. and now im stuck.. i have absolutely no idea wat to do next please help... anyone???? Depends, did he download a game off the site or was it embed onto the web page, only way is if it was downloaded and not embedded. What is iwingameshookie.dll? - iwingameshookie explanation. It doesn't seem like a trojan, but it seems recommended to delete the file. Click on iexplore.exe, then click "end process"
Go to your Control panel, then Add/Remove programs. Uninstall iWin Games if found. Go to Windows update and make sure you have the latest security updates. i got as far as windows explorer but i didnt understand how i navigate to the file.. found windows exploroe in my accesories then wat do i do?? do i open it?? if so then what?? like i said im a complete dummy when it comes to these sorts of things.. please help..
- C:\ Is your hard drive that Windows is installed on. - In C:\ there is a folder named Program Files, click on it in the left pane OR double click on it in the right pane. This will open the Program Files folder and display it contents in the right pane. 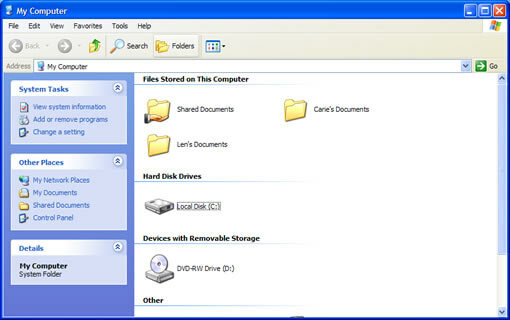 - In the right pane find the folder named iWin Games, right click on in and chose delete. If it was already removed, it won't be listed. 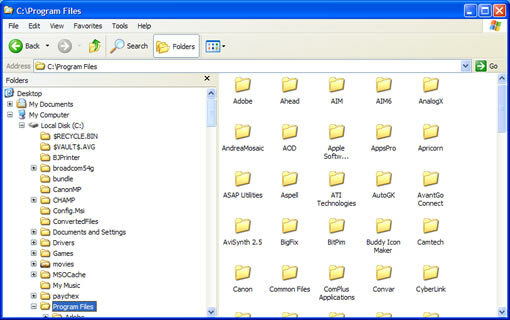 Here are some screen caps of Windows Explorer, if your looks like the first one, click on the folders button on the top. Trojan is the worst virus that a system can get and the deletion is quite so difficult. Try using kaspersky anti virus or you will have to format the hard disk.